My sister and I were walking innocently through the Manchester Art Festival when a nice young man offered us free chips. If you know me, you know I NEVER turn down a chip! Truth be told, I almost did turn them down because I have not been so impressed with any rice chips, soy chips, veggie chips or any other non-fried potato chip I have tried. But my sister insisted saying that the Sweet Chili were her very favorite, and heck, they were free! We grabbed a bag of Sweet Chili riceworks and a bag of Parmesan, through them in our bag, thanked the guy, and were on our way. We completely forgot we even had them. I am having an off day today, and needed something to give me that eaters-high that always makes me smile (don’t judge me!). I walk in the kitchen, and I swear the Sweet Chili riceworks smiled at me! They look like Doritos, but they are a little thicker. They are crunchy, and not at all greasy. But beside the no-grease, they are pretty close to a Doritos consistency. The Sweet Chili flavor is amazing! Sweet with a tiny bit of spice. Perfect! 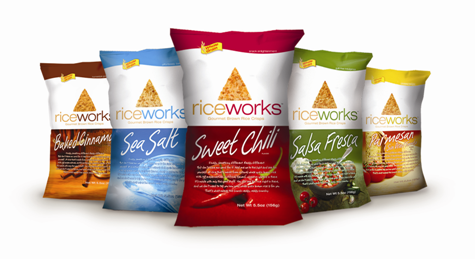 Riceworks has re-birthed my belief in the alterna-chip! The only pitfall, they aren’t short on calories and fat. They have 14o calories and 6 grams of fat per 10 chips. But, they are gluten & wheat free and vegan friendly. But hey, they wouldn’t be chips if they were any healthier! This entry was posted in Reviews and tagged brown rice crisps, chips, product review, review, riceworks, snack alliance inc., snacks, sweet chili, vegan by reneeh. Bookmark the permalink.